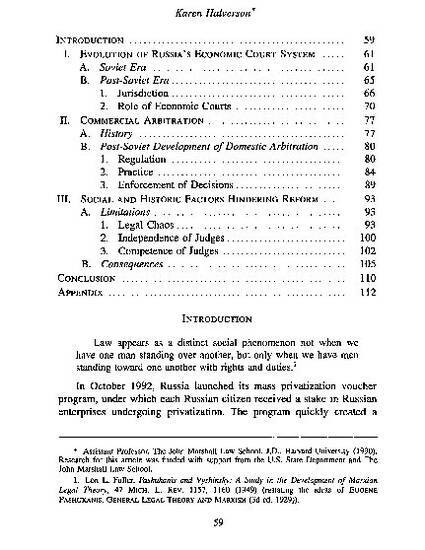 The purpose of this paper is to examine the recent transformation of state arbitrazh into economic courts along with the development of commercial arbitration in Russia, and to consider the relative utility of these mechanisms for resolving disputes in Russia's evolving market economy. Part I describes state arbitrazh and details its evolution into the existing system of economic courts. Part II discusses the past and recent development of commercial arbitration in Russia as an alternative to litigating domestic disputes. Part III considers various social and historic factors that hinder genuine reform.